What a satisfying conclusion to this excellent trilogy by Laini Taylor. 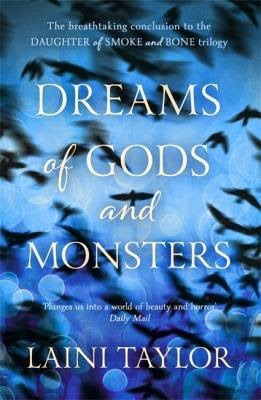 I’ve previously reviewed the other two stories on this blog and I was so excited to see how the author was going to conclude her complex and beautiful account of monsters versus angels. In this book the angels finally cross from their world, Eretz, through the portal into Earth, where Karou and her band of surviving Chimera have been slowly rebuilding their strength and numbers. The angels seek human weapons in order to finally annihilate the Chimera race (and perhaps the human race as well). Karou and Akiva’s previously rival armies must reach a tentative truce in order to join forces and face the threat the angels pose not only to humans, but to the future of Eretz. Meanwhile, Karou and Akiva’s relationship is slowly improving, but many doubts and questions remain which have the potential to prevent their true happiness. Taylor also manages, in this 600 page novel, to introduce (and conclude) another sub-plot, that of the mysterious race of angels known as the Stelians, as well as explaining much of the history of Eretz, the world which has been so beautifully constructed by the author. I’d highly recommend this series. Taylor has concluded it neatly, yet left the door slightly ajar for a potential new series in the future. We’ll just have to wait and see!